UPDATE 04-08-2018: this article was first published on 16 Oct. 2015, when I had only 23 Cape Verdean AncestryDNA results available for my analysis. As my survey has been ongoing I have managed to collect a sample group which is now four times greater. Consisting of no less than 100 AncestryDNA results of fully Cape Verdean-descended persons! The second chart features an additional macro-regional breakdown into “Upper Guinea”, “Lower Guinea” and “Central Africa” which is of my own making. In order to get a strictly “SSA” comparison i have excluded the region “North Africa” and corrected the other averages accordingly. Making this distinction is admittedly arbitrary and can only produce a rough proxy, given the limitations of AncestryDNA. Still I find it useful because you get to see some patterns more clearly and it conforms with what’s common in slave trade literature. For ethnolinguistical and historical maps from these 3 main regions of provenance see: Upper Guinea, Lower Guinea, Central Africa. This third chart is showing an inter-island comparison for those samples who mentioned both parents being from the same island. It’s obviously very limited because of the minimal samplesize. Also some of the results were from close relatives (siblings, parents/child). Still perhaps already 1 or 2 visible trends might also be obtained with larger samplegroups. 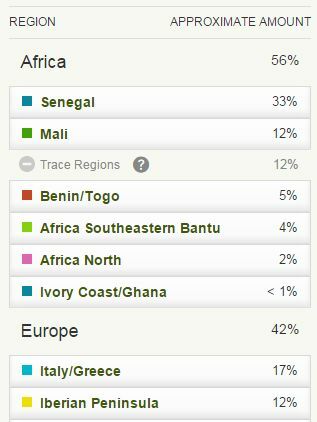 • All Cape Verdeans in my samplegroup consistently show “Senegal” as number 1 main region. 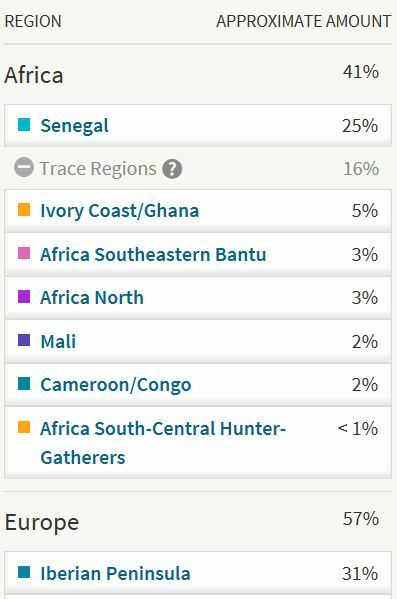 Calculated as a ratio on average “Senegal” is almost 60% of total African ancestry, which is the highest regional ratio i’ve observed for any nationality in my study. 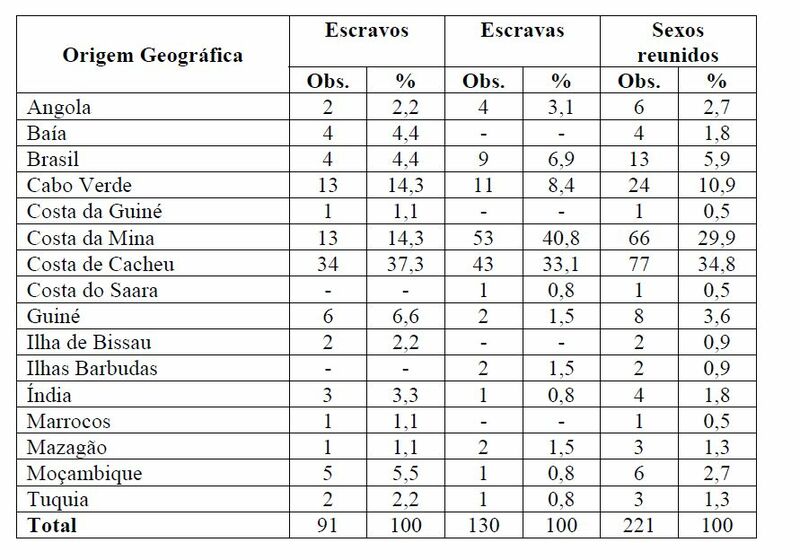 This finding seems to demonstrate the relatively much higher homogeneity of regional African origins for Cape Verdeans when compared with other parts of the Afro-Diaspora (see also Afro-Diaspora AncestryDNA results: A Comparison). • The exact implications being made by the socalled “Mali” region are quite uncertain (see AncestryDNA regions). But it seems meaningful that “Mali” is convincingly appearing for Cape Verdeans as second biggest African region. It’s perhaps also telling that the range of the “Mali” scores only goes to a maximum of 27,5%, while it’s median score of 11,6% shows its consistency. Implying it’s a significant ancestral component but always minor and in addition to “Senegal”. I suppose it may suggest widerranging Upper Guinean origins beyond strictly Senegambia. I will discuss this in more detail in the third section below. • Surprisingly also minor contributions are showing up for both Lower Guinea and Central Africa. This is unexpected when going by Cape Verde’s geographical location and what historical sources have documented about slave trade patterns between Cape Verde and the mainland (see “Cabo Verde, Raizes na Africa“). These sources clearly describe the area in between Senegal and Sierra Leone as practically the only provenance zone for African captives brought to Cape Verde safe for some individuals who came on atypical slave voyages from further away. Some of these persons, mainly from Ghana, Benin, Angola and Congo, have been documented. See charts in section 5 where all the non-Upper Guinean references have been highlighted with red arrows. 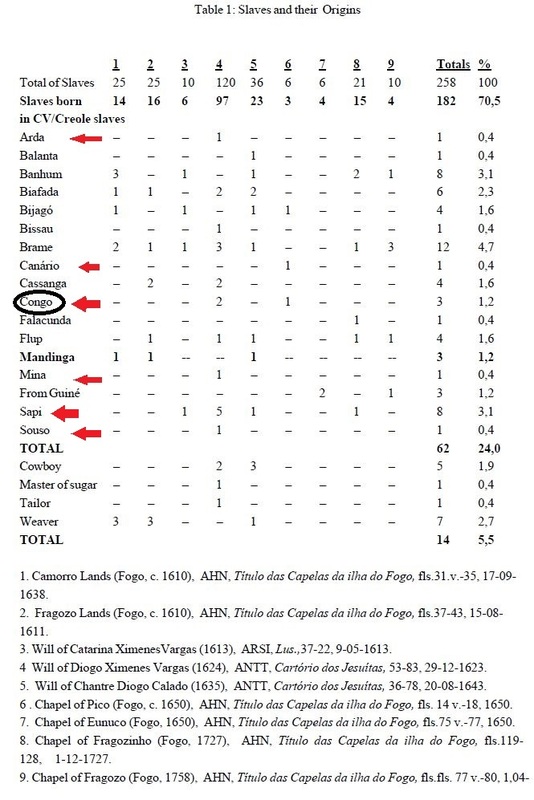 Judging from the existing data (1856 slave census and slave registers from Fogo/Santiago) they were a very small minority, probably around 1% and at most 5%, but certainly not 25% as suggested by the AncestryDNA findings. Their bloodlines can be expected to have diluted quickly so it’s a rather puzzling outcome. I’m personally not aware of any genetical studies in support of any degree of non-Upper Guinean origins for Cape Verdeans. The two studies i have already referenced both suggesting a completely Senegambian mtDNA profile. This outcome also seems hard to explain when going by the cultural traditions of Cape Verde which only show Upper Guinean influences in its Creole culture for all i know (see also “African retentions in Cape Verdean Culture & Language“). • First thing to consider is that scores for “Ivory Coast/Ghana”, “Benin/Togo”, “Nigeria” “Cameroon/Congo” and “Southeast Bantu” are mainly reflecting Trace Region estimates which also include zero percent. Also given other limitations of the AncestryDNA analysis it might therefore perhaps be premature to speculate on what these findings might really represent or how robust they might be. They might merely be reflecting generic West African DNA markers which cannot be distinguished yet with greater reliability. Or it could be a misreading of ethnic origins from especially Sierra Leone. 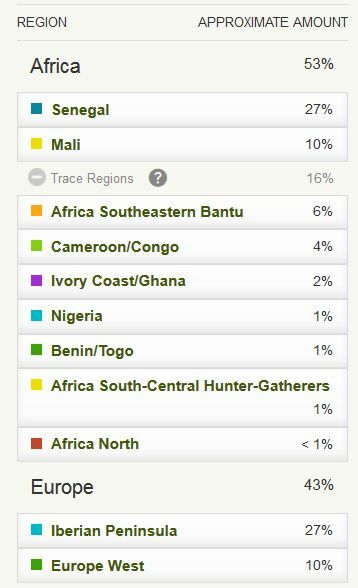 Probably only an update of AncestryDNA reference populations might bring more clarity or else comparing with the AncestryDNA results of actual Upper Guineans (to verify if they also show other regions besides “Senegal” and “Mali”) . • At this stage we might however already note that especially the average score for “Southeast Bantu” seems like it’s a valid finding above “noise” level. Also taking into account the median and the min./max. range. It becomes even clearer when comparing with the results from other parts of the Afro-Diaspora as Cape Verdeans are scoring similar group averages for “Southeast Bantu” as both African Americans and Haitians (see also Afro-Diaspora AncestryDNA results: A Comparison). I suppose it might be possible then that captives brought from other parts of Africa, especially Angola and Mozambique, were more frequent in Cape Verde than recorded by history. If so this research outcome would be the first genetical confirmation of such a Palops connection! However there might also be other explanations. For more discussion see the fifth section. • The average findings for the “North Africa” region are much more in line with what you would expect, given Cape Verde’s history and geographical location. The “North Africa” scores are also more likely to be valid even when reported as a Trace Region. Afterall “North African” scores are also showing up for Cape Verdeans in other types of DNA testing and DNA studies. So in this way no surprises. However there’s still the remaining question of how exactly did this minor proportion of “North African” DNA enter Cape Verdean bloodlines? As a popular explanation it’s usually atributed to exciled Mourisco’s or Conversos, from the earliest colonization period. However there might also be other scenarios at play. For more discussion see section 4. • Cape Verdeans can be expected to be a very closely interrelated people across the islands because of their shared history. But it might still be useful to study any of the seemingly small differences occuring between the various islands. As it could tell us more about which ethnic groups might have been involved in the settlement of each island to a possibly greater degree than elsewhere. Genetic differentation between the northern islands (“Barlavento”) and the southern ones (“Sotavento”) has already been reported in DNA studies (see “DNA Evidence“). And it has been correlated with “a common origin in Santiago, followed by differentiation through genetic drift and subsequent input of independent external migrations” (Beleza et al., 2012). Each island has “Senegal” as biggest region, but calculated as ratio of total African ancestry “Senegal” seems to peak sofar in Fogo, while it’s lowest in Brava. It might suggest something about the composition of Upper Guinean origins being more or less homogenous or restricted to Senegambia proper. Notice also how the Brava islanders among my samplegroup scored the highest “Mali” on average. None of the Lower Guinean or Central African regions seem to be islandspecific. Except for “Cameroon/Congo” which clearly peaks among the 5 samples from Santo Antão and even more so for the one result from São Nicolau. Again much caution should be applied when interpreting this outcome but it might be an ancestral hint that somehow people of Congolese or (northern) Angolan origin were present in the northern islands to a relatively greater degree than elsewhere and left a minor yet detectable genetical legacy diffused among the general population. However keeping all options open it could also be something specific for only these 6 samples and reflecting unique lines in their family trees. Possibly even involving intermarriage with (mixed-race or black) Brazilians who are also likely to be carrying these Central African DNA markers. “North Africa” shows the highest scores sofar among the 5 samples from Brava. 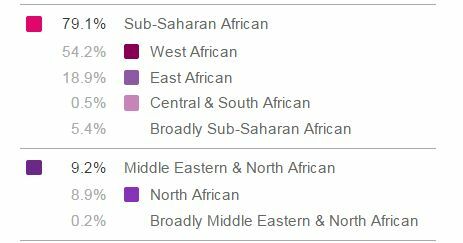 On 23andme i have also kept track of North African (MENA) scores for Cape Verdeans. (see this online spreadsheet). And similarly i found that it was on average higher for people from Fogo and Brava. It could be due to a founding effect from the earliest colonization period. However in part it might also be correlated with their generally larger European ancestry. For more discussion see section 4. Source: “The Atlantic Slave Trade: A Census” (Curtin, 1969). Source: Ethnic Origins of Peruvian Slaves (1584-1650). Figures From Upper Guinea.”, Paideuma, (39), 57-110, Stephan Bühnen (1993). The Mandenkalu live in about 12 villages distributed throughout the Niokholo Hills in eastern Senegal. They are part of the Mande, a mostly Muslim ethnic group of several million people that ranges from Mali in the east to the Atlantic Ocean in the west. The quote above is taken from the 23andme website and is referring to their utilization of Senegalese Mandenka samples for the “West Africa” category in their Ancestry Composition tool. These are publicly available samples from the socalled HGDP database and Ancestry.com also makes use of this database according to their white paper. Therefore it’s highly likely that the AncestryDNA region named “Senegal” is based on Mandenka samples, the very same ones as described by 23andme. In fact other DNA testing companies, DNA studies and also most of the GedMatch calculators make use of these freely available samples. 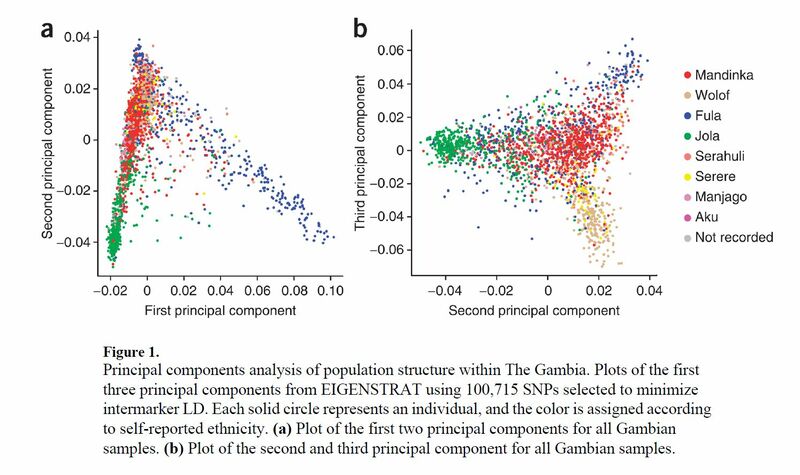 Basically what this might mean is that the scores for the socalled “Senegal” region reflect how much of your DNA was found to show the highest genetic affinity (similarity) with the DNA markers found among this rather smallsized sample group of 28 Senegalese Mandenka. However this doesn’t imply any exclusive connection to this particular group of people or their modernday nationality. Their DNA is bound to reflect widely shared ancestry among neighbouring ethnic groups living in not only Senegal but also Gambia and Guiné Bissau. And probably to some degree also among other related ethnicities in western Mali and elsewhere too. 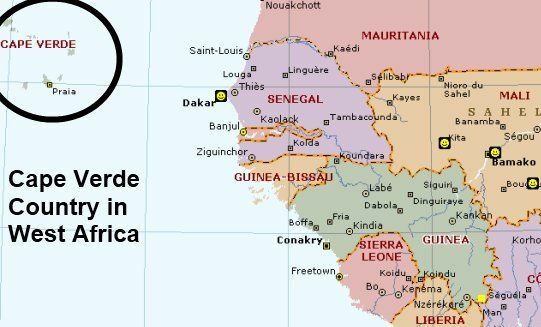 We have to keep in mind that DNA is not unique to any given ethnic group and doesn’t respect national borders and certainly not artificial ones like those for Gambia which is really an enclave entirely surrounded by Senegal except for its coastal line. Therefore the country name labeling of the AncestryDNA regions should not be taken literally or at facevalue. This much is also mentioned by Ancestry.com themselves in the descriptions they provide for each region. For more discussion see also “AncestryDNA Regions“. Having said that this socalled “Senegal” region is rather distinct and probably among the most predictive ones among the nine African AncestryDNA regions. This can be verified from the way “the typical native” scores 100% “Senegal” on average. And it is also confirmed by the consistent top ranking scores of “Senegal” for Cape Verdeans. It’s well known that some of the most heavily frequented slave ports for transit to Cape Verde were located in the modernday territory of Guiné Bissau and to a lesser degree also in Gambia. It’s unthinkable therefore to leave out both countries when considering the “Senegal” scores. However in the most earliest timeperiod (1460-1560) Portuguese slave traders in fact did also visit Senegal itself very often. Especially the Wolof/Jolof empire, breakaway Sereer kingdoms and also the Mandinga and Casanga kingdoms further south in Casamance or along the Gambia river. In fact judging from cultural retention it can be said that the Wolof and the Mandinga probably were most influential in Cape Verde among the many other Upper Guinean groups known to be present (see also “African retentions in Cape Verdean Culture & Language“). 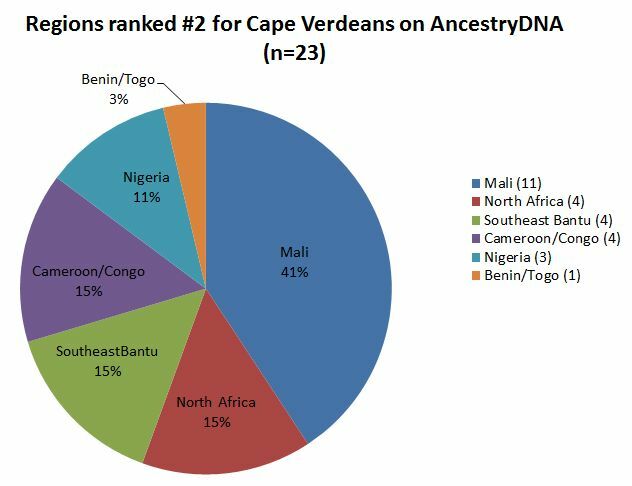 So therefore this “Senegal” dominance reported for Cape Verdeans on AncestryDNA might seem fitting still. It seems that genuinly Senegalese origins might have been at its height during the earliest timeperiods. In the first chart above it is estimated to be about 37% around 1526-1550. About equal to the 40% proportion of Guiné Bissau. However in the preceding decades it’s likely to have been even higher, this period (1460-1550) being crucial for the formation of the Cape Verdeans as a new ethnic group. In the next century (1550-1650) Cape Verde was still a major collecting point for the re-export of Upper Guinean captives, however at the end of this period its slave trading function went into steep decline. The samplesize in the second chart is rather small but its patterns are consistent for many different locations in the Hispanic Americas and have also been confirmed in other sources (for more similar charts see this page). Guinean Bissau origins (“Brames”, “Beafares” etc.) are predominating while also Sierra Leone (“Sape”) and Guinea Conakry (“Sosu”) had a significant presence. Senegalese origins are still being documented (“Jolofo”) but are on the decrease. By the time of 1731 a clear majority of Cape Verdeans had freed status (83%), so we can assume that the origins of enslaved Africans after this time would be less relevant over all (see this page for more details). When the 1856 slave census was held in Cape Verde in fact the African-born part of the population might have been no more than 1%, virtually the whole population being “Creole” therefore, often also multigenerationally so. When reviewing the third chart we can see that “Guiné Portuguesa” (also including Casamance=southern Senegal) is mentioned for 13,5% of all captives, while Senegal-Sierra Leone is mentioned for only 2,5%. So the predominance of Guiné Bissau (+Casamance) origins continued to increase as Portuguese influence in the greater Upper Guinea area was on the wane because of French and English encroachment. However in this relatively late period persons of Senegalese descent are still being reported for Cape Verde, even when their numbers are quite minimal at this stage. 3) “Mali” pinpointing Malian origins or also from Sierra Leone & Guinea Conakry? Source: “Africanismos na língua caboverdiana (variante de Santiago)”, Nicolas Quint (2008). This section will be speculative by necessity as the socalled “Mali” region seems to be one of the weakest defined of all AncestryDNA regions. A “typical native of Mali” only scoring 39% for it, while a mere 16 samples were used to underpin this ancestral cluster (see AncestryDNA Regions). 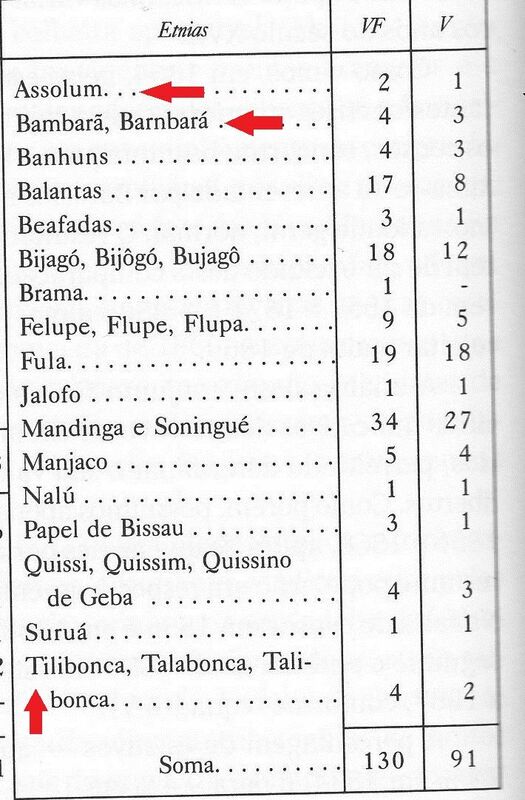 Still it’s fascinating to ponder about what exactly these “Mali” scores might imply for Cape Verdeans. To start it off solid evidence of genuine Malian presence in Cape Verde does exist. Even if to a minor extent and largely from later timeperiods. See for example the first chart above in which not only “Bambara” captives are being mentioned, likely to be a reference to the Bamana people of Mali or at least from the deep interior. But also “Assolum” and “Tilibonca” are being listed, references to ethnic groups which are located in the border area in between Mali and Guinea Bissau/Conakry. For more details see also “Cape Verde Slave Census of 1856 (part 2)“. 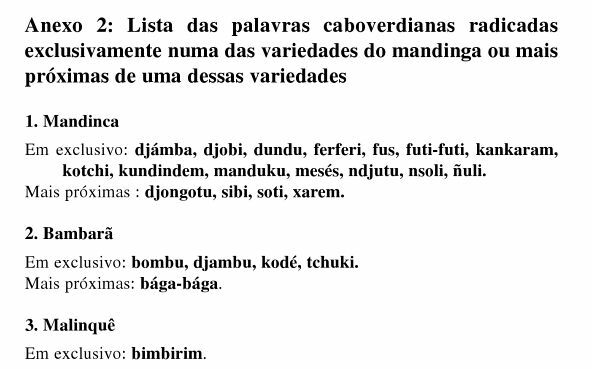 Furthermore there are some very intriguing linguistical indications that the Bamana/Bambara language, a Mandé version from Mali, influenced Cape Verdean Crioulo. According to research by Quint (2008) it would be minor to the influence from the proper Mandinga version, as spoken in Guiné Bissau and Gambia, but still noticeably present. In fact also a trace element of Malinké or Maninka is being detected, which is a Mandé version being spoken in both Guinea Conakry and western Mali. For detailed maps showing the distribution of the Mandé languages see this page (scroll down to Mandé speakers) Sahel Region. So there does exist corroborating evidence which might support the “Mali” scores as being genuinely Malian, at the very least partially so. Even when according to many historians the export of captives from western Mali for Trans Atlantic purposes, only got started in the late 1600’s. By this time Cape Verde was already in economic decline and largely cut-off from the main slave trade routes. Also the greater part of its African origins might then already have been encapsulated in its locally born Creole population. All of this arguing against any noticeable involvement of Malians in the ethnogenesis of Cape Verdeans in favour of more coastal Upper Guinean origins. However it might just be that the interior origins of Upper Guinean captives in the earliest timeperiods have simply been overlooked by contemporary reports or obscured by the umbrella term of “Mandinga”. One would assume that especially the breakup of the formidable Mali and Songhay empires in the late 1500’s would have produced a flow of prisoners of war in part also being transported to the Upper Guinean slave ports as an alternative to the Trans Saharan trade routes. 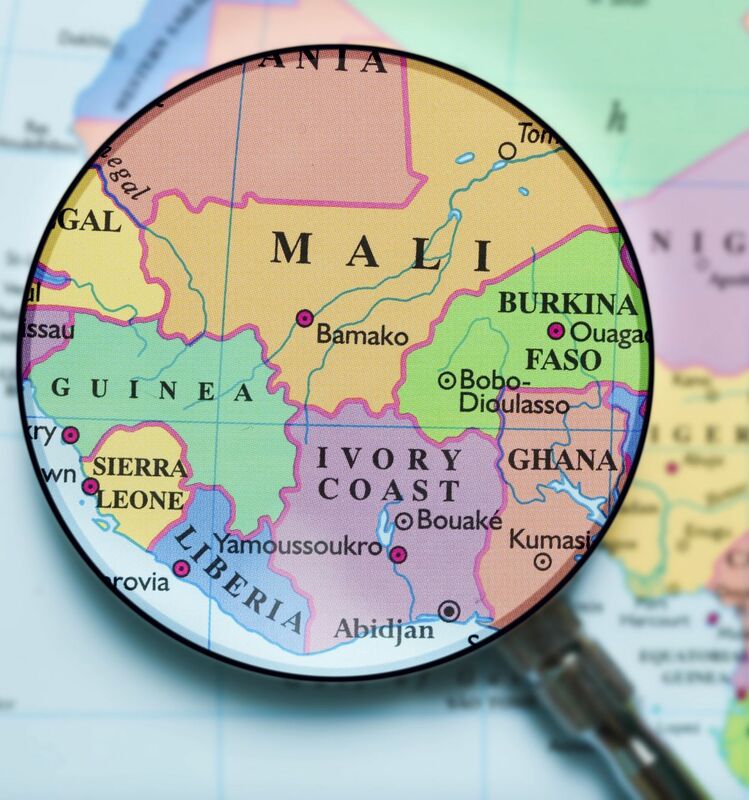 Still another possibility to explore is that the “Mali” region is not indicating Malian origins but rather from Guinea Conakry (as also mentioned by Ancestry.com itself) and Sierra Leone. This last country currently not represented among the reference populations used by Ancestry.com. Which means that any degree of ancestry from Sierra Leone will be measured by the existing 9 African AncestryDNA regions, “Senegal”, “Ivory Coast/Ghana” and “Mali” being the most likely candidates perhaps. The historical connections between Sierra Leone and Cape Verde have been quite significant during the 1500’s-1700’s, even when often unknown to the general public. Temne, a a language spoken by one of the biggest ethnic groups in Sierra Leone, has been identified as the source for several culturally meaningful words used in Cape Verdean Crioulo, such as “Tabanka” and “Funco” (see also Crioulo language). Its ancestral contribution to the Cape Verdean genepool might therefore have been underestimated. For a summary overview of the likely (sub)regional imputs from within Upper Guinea to Cape Verde’s genepool see: Regional Origins. Also see the entries for Cocoli, Baga, Susu, Jallonké and Sape in Top 20 Ethnic Roots. To get a quick inituitive notion it’s perhaps best to compare with the historical presence of the socalled “Sape” or also “Zape” people in the Hispanic Americas. This was an umbrellaterm used for various people living along the coast from Guinea Conakry to Sierra Leone. Because of well documented warfare with the socalled Mane people in the late 1500’s it is known that captives from this area were especially prevalent during the 1560’s-1590’s (see various charts on this page). This period can be considered to have been quite crucial for the formation of locally born mixed-race populations in the Hispanic Americas and the retention of minor African bloodlines among otherwise predominantly Amerindian/European mixed people. In this light it is very fascinating to see in the chart above how the socalled “Mali” region seems to peak in Latin America and especially among Mexicans. This chart illustrates very clearly the shared Upper Guinean roots (as measured by “Senegal” and “Mali”) between Cape Verdeans and Latin Americans (see also Afro-Diaspora AncestryDNA results: A Comparison). But even more so it might provide some hints about how “Mali” could be interpreted (in part). As it can be assumed that the ultimate sources for these “Malian” DNA markers will be largely the same for both Cape Verde and Latin America, especially those countries who only participated in early slave trade (1500’s/1600’s), such as Mexico. Given the well defined slave trade patterns for Mexico, it’s unlikely that any significant “genuine” Malian origins are being pinpointed as they have not been documented for Mexico as far as i know. However a “Zape” presence from Sierra Leone is well attested for Mexico. Lasting into the 1600’s there even was a Zape Cofraternity for them in Mexico City (see this Wikipedia article). It is also striking how for most Hispanic Americans the average scores for “Mali” and “Senegal” are similar or even equal in proportion but for Cape Verdeans “Senegal” is about 5 times larger than “Mali”. It seems to suggest a difference in proportional origins from within Upper Guinea, with those for Cape Verde possibly being more regionally concentrated towards the area around Senegambia proper and Guiné Bissau. While those for Hispanic America being more equally spread out over Upper Guinea. Perhaps having to do with Cape Verde’s colonial settlement in 1460 preceding those from the Hispanic Americas by several decades causing relatively more founding effects from this earlier period. Still the Cape Verdean “Mali” scores are also substantial in themselves. Again this section is mostly based on (informed) speculation and it’s quite possible that these findings will not be replicated with future updates for AncestryDNA. Also i suppose that ethnic groups from within Senegambia and Guiné Bissau might also score high on “Mali” and therefore could have been the (partial) source of these markers. One likely candidate perhaps being the Tenda/Bassari speaking peoples from eastern Senegal and interior parts of Guinea Bissau/Conakry, they are supposed to be the pre-Mandinga natives of the area. It’s unfortunate that Ancestry.com hasn’t made public sofar (afaik) the ethic background of the samples they used for the “Mali” region. Although it’s likely that either Bambara or Dogon samples were used as they are also commonly used in DNA studies and the Ged-Match calculators. 4) “North African” percentages via Portugal, the Fula or directly from North Africa? Source: “Dissecting the Within-Africa Ancestry of Populations of African Descent in the Americas” (Stefflova et al., 2011). This section is merely meant to illustrate the various ancestral options which might explain the minor “North African” percentages appearing for almost all the Cape Verdean AncestryDNA results i’ve collected. I don’t pretend to know the definite answers to the question of how exactly this ancestral component came to be. For all i know it might be because of a combination of the options described below or there might even be more possible explanations. Obviously individual familytrees will also stand in the way of a “one size fits all” narrative. The socalled “North African” scores are at any rate an intriguing part of Cape Verdean genetics, even if its direct provenance cannot yet be ascertained with 100% reliability in all cases. It is a good reminder that geographical labeling of ancestral components can sometimes be misleading. Only a future upgrading of DNA testing might provide more clarity i suppose. On AncestryDNA the “average” Portuguese seems to score minor yet detectable scores for “North Africa”. As Cape Verdeans themselves tend to have a considerable degree of Portuguese ancestry, i suppose it could be possible that (part of) these “North African” markers were inherited through Portuguese ancestors. These “North African” scores for Portuguese are also to be seen on other DNA testing platforms, such as DNA Tribes and Ged-Match. It’s crucial to understand that on each DNA test “North Africa” might imply different things, especially when it concerns timeframing and socalled “deep ancestry“. A historical connection with the Moorish occupation of Iberia is quickly made however these scores are sometimes also interpreted to be representing a much more ancient affiliation dating back to prehistorical times. The relatively high “North African” score for Galicians on DNA Tribes seems to point in that direction, Galicia never having been ruled directly by Muslims. In contrast 23andme’s Ancestry Composition aims to describe only recent origins from about 500 years ago. Therefore it might be telling that on 23andme the Portuguese results seem to score barely any “North Africa”. 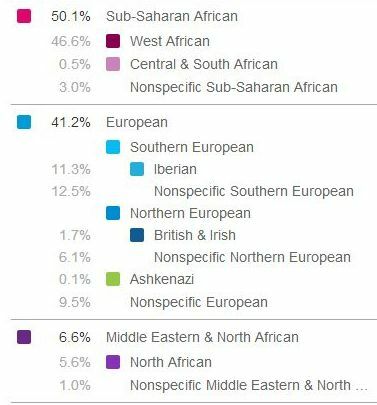 The screenshot i posted above shows the highest “North African” % i’ve seen among a group of 31 Portuguese people i’m sharing with on 23andme but most of them are actually scoring zero for it. 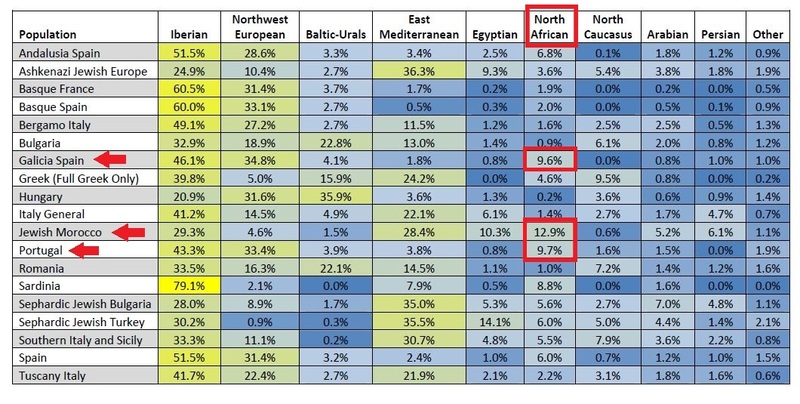 On the other hand for Cape Verdeans on 23andme “North African” is still being reported and for the ones i’m sharing with it’s on average about 3% (see column G in this spreadsheet). Which is pretty close to the 2,6% “North Africa” i calculated for the original (unscaled) Cape Verdean AncestryDNA results (see column N in this sheet). Possibly indicating that other sources for “North Africa”, beyond indirectly via Portugal, might still be more relevant. The AncestryDNA results for the Fula person, showing 16% “North Africa”, points towards a second possibility. “North African” DNA markers reported for Cape Verdeans might (in part) have been inherited from the Fula people. The historical presence of the Fula in Cape Verde is well documented (e.g. see the 1856 slave census) and it’s also well known that their ancestral make up reflects a minor but sizable portion of “North African” DNA, most likely to be larger than for Portuguese. So this seems like a plausible explanation, even when the approximate proportion of Fula’s among other Upper Guinean origins for Cape Verde is still to be determined. See also the Fula entry in Top 20 Ethnic Roots. The best documented source for any “North African” DNA might come from the second wave of Jewish migration to Cape Verde. This time directly from North Africa and taking place in the 1800’s. This might also be independently verified by dilligent genealogical research or family stories as it doesn’t date back too far ago. See also this excellent website: http://capeverdejewishheritage.org/. The first wave of socalled Converso Jews or New Christians migrating to Cape Verde, took place mostly in the 1500’s. This event is also likely to have had genetic influence. But given that they were Sephardi Jews who had settled for centuries already in Iberia, it’s uncertain whether their inherited DNA markers would be read as “North African”. While for the second wave some minor degree of intermarriage with North Africans might be assumed (judging also from 23andme results of Moroccan Sephardi). The genetic legacy of the first wave might however (partially) account for the higher than expected “Italy/Greece” results on AncestryDNA, seen especially for people from Fogo and Brava sofar. Again the country name labeling not to be taken literally but rather to be seen as some eastern shifted Mediterranean component. As a final most speculative option it’s intriguing to correlate the minor Mauritanian mtDNA findings with possible founding effects from North African slaves in the earliest settlement period (1400’s/1500’s). This early period is not well documented for Cape Verde but perhaps we can learn more by drawing some analogies with the colonization experiences of other Iberian ruled islands. First of all the fellow Macaronesian islandgroups: the Açores, Madeira and the Canarias. For those places it is known that the local settlers initially resorted to slave raiding along the Northwest African coastline (Morocco/Mauritania) in order to find new labourers and perhaps also consorts/concubines. These captives were local Berbers and also Guanches. Many of them also ending up in Portugal during the 1400’s and possibly to some extent also in Cape Verde? Intriguingly in a slaveregister from Fogo dating from a somewhat later timeperiod (1650) one slave is being described as “Canario” (see chart in section 5). Also in Portugal itself North African slaves were still being documented in the late 1600’s (see chart in section 5). A second parallel may be drawn with the Dominican Republic. We know that in the earliest colonization period of Hispaniola experienced slaves and also trusted servants, the socalled Ladino’s, were taken along by the Spanish settlers. As they found themselves in unfamiliar territory it makes sense they didn’t rely on African born labourers at first. Again i like to emphasize this is pure speculation on my part, but in analogy could it possibly be that the first Portuguese settlers in Cape Verde took along North African servants they already had in Portugal itself? 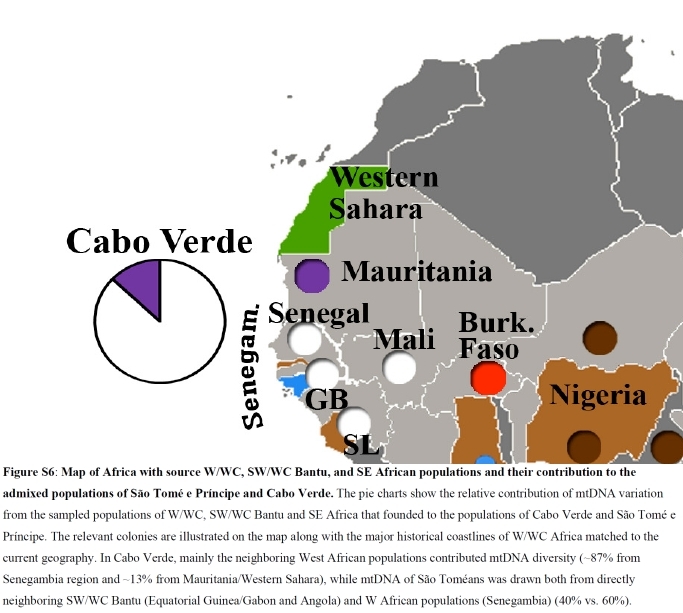 To be sure these maternal lineages of seemingly Berber origin might also have found their way in Cape Verde through other ways, as they also have been reported to some extent for Upper Guinea itself (see this paper). Again a Fula scenario being most likely in this case. Either way it’s not too farfetched to assume that whomever left behind the Berber like mtDNA in Cape Verde would also have left behind an autosomal legacy read by AncestryDNA as “North African”. 5) “Southeast Bantu”, artefact or genuine? As was already mentioned in section 1 “Southeast Bantu” scores for Cape Verdeans are surprisingly high, also when compared with other parts of the Afro-Diaspora. I think the first thing to keep in mind is that this is the very first time such a detailed regional breakdown of African ancestry has been attempted (commercially). I’m sure with upcoming updates for AncestryDNA we might see some drastic changes, as also occurred with the previous ones. There’s a real chance that especially the “Southeast Bantu” percentages might prove to have been inflated. There’s much room for improving the “Southeast Bantu” region because right now only 18 samples are being used for it, most likely from South Africa and/or Kenya. Strangely enough these samples are right now also partially showing affinity to the Middle East and North Africa! (see AncestryDNA Regions). Obviously adding samples from Mozambique and Angola will provide a much better picture. In DNA testing “East African” ancestry often tends to get defined in misleading ways. Generally speaking a distinction between Northeast Africa (Nilotic & Cushitic speaking origins) and Southeast Africa (Bantu speaking origins) would work best. 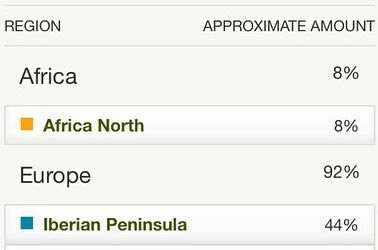 However currently on AncestryDNA there is no separate category for Northeast Africa. Which results in Ethiopians and Somali’s being shown to have “Southeast Bantu” ancestry (scroll down African results). This is clearly a misnomer and a consquence of missing reference populations from Northeast Africa. On 23andme it’s the opposite and “East Africa” is actually referring to Northeast Africa (see also this page), while “West Africa” is including Bantu origins from Southeast Africa. Now why does this matter for the “Southeast Bantu” scores for Cape Verdeans you might wonder? Well it’s because people of Fula descent also tend to score minor “East African” percentages as can be seen in the 23andme screenshot and the AncestryDNA summary. To be fair i have only seen one such Fula result on AncestryDNA and only a couple few more on 23andme with less pronounced “East African” scores (see this page). It’s most likely a reflection of very ancient ancestral connections, possibly dating from the Green Sahara period. But either way with Cape Verdeans having partial Fula ancestry, it might be expected they could have inherited some of these “East African” markers in pretty much the same way as socalled “North African” markers. There is however one flaw to this theory and that is that Cape Verdeans do not seem to score any detectable “East Africa” on 23andme (see column O in this spreadsheet). So that leaves us to search for any explanations which might validate this AncestryDNA outcome as representing genuine origins from most likely Angola and/or Mozambique. If found to be truly so (even if only partially) I suppose this could be the first time a noticeable Central African contribution to the Cape Verdean genepool has been detected in a systematic manner. My samplegroup being admittedly limited in number, yet also randomly picked and with most of the islands represented. The “Southeast Bantu” scores being rather consistent for most and also sometimes being ranked in second place above “Mali”. “Cameroon/Congo” more often being reported as Trace Region, however with some noticeable high outliers. And also appearing in minimal pecentages but still perhaps telling the “South-Central Hunter Gatherers” (Pygmy/San) region. Another noteworthy feature perhaps being that among my samplegroups only the Mexicans and Colombians are showing higher average “Southeast Bantu” scores than “Cameroon/Congo”, just like Cape Verdeans, while it’s the opposite for practically all others (see chart in section 3). It seems to suggest Angolan/Mozambican origins might have been more prevalent than Congolese. As already referenced up till now only mtDNA research has been done for Cape Verdeans, with their maternal lineages being found to be strictly Northwest African. Leaving aside any inherent flaws in that type of research i suppose this might imply that the minor Central African ancestry detected for Cape Verdeans would have originated from male ancestors. So perhaps not by coincidence the two individuals from Angola and Cabinda, mentioned in the slave census of 1856, were also male (v). They are among the very few isolated references to Central African persons being present in Cape Verde. 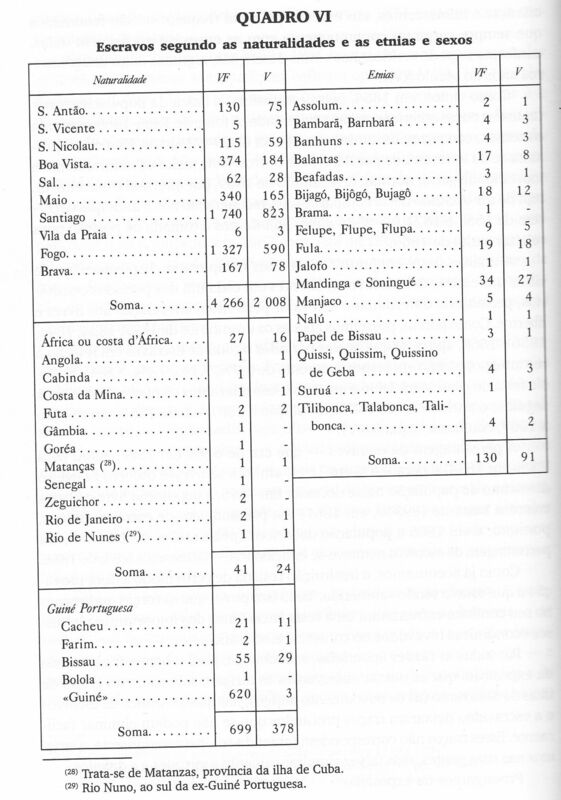 Reviewing the 1856 census data out of a total of 5,182 slaves only 2 are explicitly mentioned as having Angolan origins. Even if we include the 2 persons from Rio de Janeiro as likely having Central African origins or even all 41 persons reported with origins outside of Upper Guinea we still end up with a proportion of only 0,8%. Looking at the second chart above we find there’s 3 “Congo’s” being mentioned out of a total of 258 slaves, only 1,2%. The existing documentary records therefore don’t really seem to support the extent of the “Southeast Bantu” scores being reported sofar. Rather they seem to describe isolated individuals who ended up in Cape Verde by chance, and not because of some structural patterns. Afterall in my macroregional breakdown “Central African” ancestry for Cape Verdeans could be as high as 13% of total African ancestry according to AncestryDNA. Which seems to suggest far greater numbers and a more sustained presence if genuinly pinpointing Central African ancestry. But no documentary nor cultural indications seem to exist for such a surely noticeable presence. Then again the documentation of ethnic origins in Cape Verde is very fragmentary, especially for the earlier timeperiods when it functioned as a slave trading hub. Also unexpected ancestral components have been detected for other populations and eventually found to be “the real deal” even when largely unaccounted for at first. Source: “O escravo africano na vida económica e social portuguesa do antigo regime”, (Lahon, 2004). To conclude this discussion i like to repeat that at this stage definite answers may not be at hand given the current limitations of the AncestryDNA analysis. However i will also provide some final speculative scenario by which the reported “Southeast Bantu” scores could still make sense. Generally speaking i suspect any inflow of people of Central African origins occurred mostly because Cape Verde was used as a stopover for the main sailing route between Portugal on the one end and São Tomé, Brazil, Mozambique/Asia on the other. All sorts of trading goods were transported (sugar, spices, textiles etc.) but at times part of the cargo would also consist of African captives meant to be sold in Portugal or Spain. Up till the 1750’s there used to be a sizeable slavepopulation in the Portuguese capital of Lisbon. As can be seen in the above charts their documented origins are very diverse, reflecting the global scope of the Portuguese colonial empire at that time. The relevant part for our purposes however is the considerable proportion being reported for captives from Angola and especially Mozambique in the last chart (which is however covering a very limited timeperiod). It is known that at times these ships would sell a few of their slaves on the way in exchange for fresh water and food supplies. 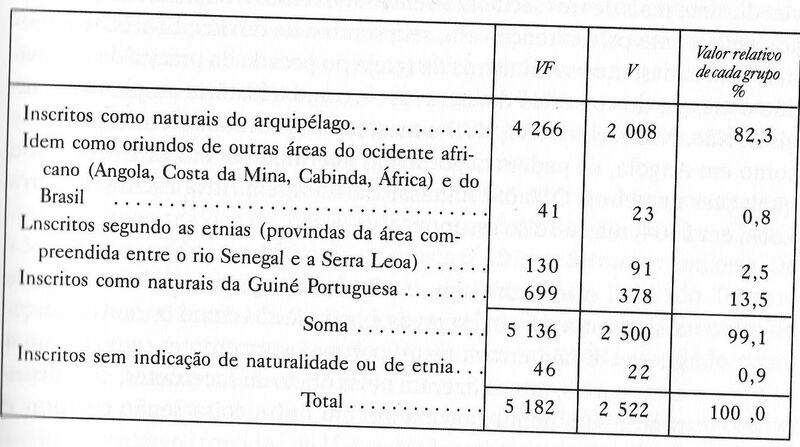 And i suppose this might account (at least in part) for the reported “Southeast Bantu “scores for Cape Verdeans. For more information on what type of ethnic origins could possibly be implied by these regional breakdowns, see also “Top 20 ethnic roots for Cape Verdeans” or this overview of ethnic groups mentioned in slave registers in both Cape Verde and Latin America. This overview also includes data for Guiné Bissau. These are the results of a parent and child. For both only “Senegal” is appearing as main region. 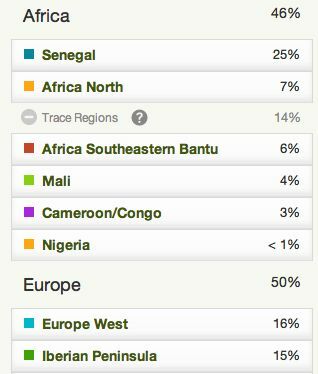 Calculated as a ratio to total African ancestry, they have very high “Senegal” scores, only one other person among my samplegroup scoring higher relatively speaking. 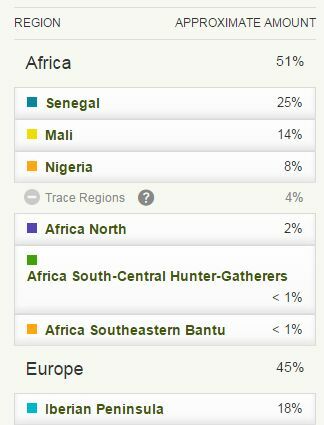 For the first result it is 70% (33/47) and the second one has 72% “Senegal” out of their total African ancestry (34/47). Eventhough not showing up in the African breakdown it’s also noteworthy to mention the 7% “Middle East” for the first screenshot. This is not a consistent component for Cape Verdeans but it does show up regularly. It could have found its way in Cape Verdean genepool by various ways. Either indirectly via Iberia or even Italy. But also through Sephardi Jews from North Africa and even also by way of Mauritania or Fula people (see African results). 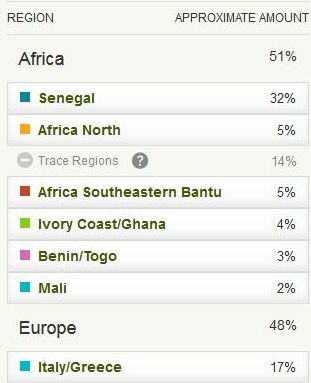 In contrast with the two previous results this breakdown below shows two additional main regions aside from “Senegal”. Eventhough this signature region for Cape Verdeans is still predominant (34/59=57%). Unexpectedly the two other regions are from areas outside of Upper Guinea, not even neighbouring ones. As discussed in previous sections this has been one of the more surprising findings of my survey. It is good to keep in mind that a future update might very well add a different spin. And we should therefore be cautious in our interpretation. But for now these percentages look rather solid, especially as they are above trace level. The 11% score for “Cameroon/Congo” also being the highest amount i have seen reported for Cape Verdeans sofar. It is intriguing to speculate how these lineages might have ended up in Cape Verde. Actually also post-Slave Trade connections might be a possibility, such as voluntary migrations from Brazil, São Tomé & Principe or Angola. These results belong to a very close DNA cousin of mine. His “Mali” score is one of the highest i had observed among my original samplegroup (n=23). Both as original score (14%) and as ratio of total African ancestry (14/51=27,5%). Also noteworthy that his minor score of “Nigeria” is not shown as a Trace region. Interestingly he has documented Moroccan Sephardi ancestry, his greatgreat grandfather being Moroccan born. His “North Africa” isn’t extremely high but in addition he also has 3% “European Jewish” and 4% “Middle East”. Together it would be about 9% while a genetic contribution from a gg grandparent would be about 6% so it seems to fit well enough. Directly following his own results i will post the results of his father, mother and sister which were kindly shared with me after having written this blogpost. Very illuminating to see how genetic inheritance within this set of family members turned out! Below are the Ethnicity Estimates of the father of the person whose results i posted directly above. He has family origins mostly from São Nicolau.The amazing thing is that again “Nigeria” is being shown above trace level, which increases the chances of it being “genuine” for both him and his son. It is the highest amount for this region i have observed sofar among Cape Verdeans. Again quite unusual for this region to appear above trace level for Cape Verdeans, but actually i have seen 4 other persons (n=38) who had “Nigeria” as second biggest African region (behind “Senegal”). While for one highly atypical case it was even the biggest region (9/18). It is intriguing to speculate how this type of DNA could have ended up in Cape Verde when no direct slave trade routes with Nigeria seem to have been in existence. There are several imaginable scenarios, one of them possibly having to do with a Brazilian ancestor of (partial) Nigerian descent who in turn had offspring in Cape Verde. In this way the “Nigerian” DNA made a detour via the Americas, another detour could also involve either Portugal or São Tomé i suppose. The next screenshot features the results belonging to the mother of my close DNA cousin. She has island roots mostly from Santo Antão and Boavista. In line with what i already observed for her son, the “Mali” amount being reported for her (24%) is the highest i’ve seen sofar among Cape Verdeans! 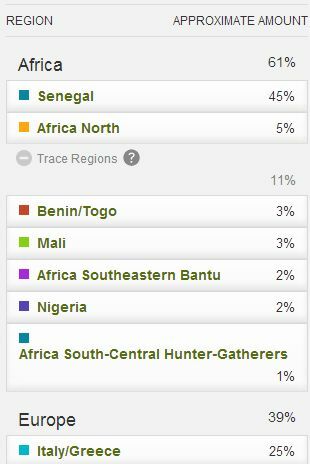 Interestingly an almost equally divided breakdown of “Senegal” and “Mali” is obtained. In my survey nearly all Cape Verdeans tend to show a clear shift to “Senegal” as predominant African region. However this example highlights clearly that individual variation still exists. Even among Cape Verdeans who relatively speaking proved to be the most homogenous in their African origins during my research. These deviating “Senegal”/”Mali” proportions might possibly suggest a distinctive Upper Guinean lineage, not commonly seen among other Cape Verdeans. Or otherwise it might just be that the “Senegal” and “Mali” DNA markers proved to be too much overlapping to make an accurate distinction. Another fascinating and perhaps telling aspect is that the combined share of Trace regions is quite minimal at 2%. Most other Cape Verdeans show a plurality of Trace regions usually inbetween 10-15% in total. To complete the family set of my close DNA cousin below are the results of his sister. Because of genetic recombination the DNA results of siblings will almost never be exactly the same as many people might expect. However the inheritance patterns will also not be completely random (see this article for more details). Comparing the breakdown below with the one i posted earlier for her brother the consistencies stand out firstmost. Both siblings have similar levels of total African (49% versus 51%), perfectly inbetween those of their parents (47% & 53%). Their biggest African region, “Senegal” is reported with the very same percentage (25%). They also still show an identical top 2 ranking in their African breakdown. However interestingly it seems that the sister has inherited proportionally more “Mali” markers (19% versus 14%) by way of her mother (who had 24%) while her brother has inherited relatively more “Nigerian” DNA (8% versus 1%).from his father (who had 10%). The remaining Trace regions, incl. “North Africa”, are again identical for both. “Senegal” is clearly predominant, also a relatively prominent “North Africa” score. 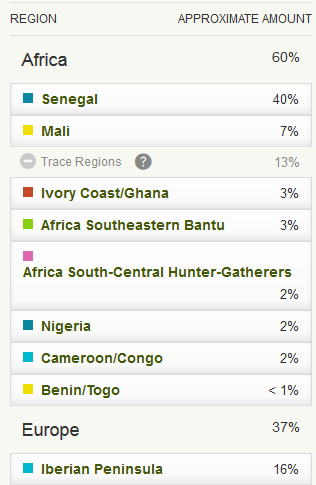 The same percentage is shown for “Ivory Coast/Ghana” but perhaps tellingly only as a Trace Region. Again quite high “Mali” score. This person was the only one among my samplegroup not to show any “Mali” in their results at all. Also “Southeast Bantu” is very minimal, however “North Africa” is quite prominent in second place. 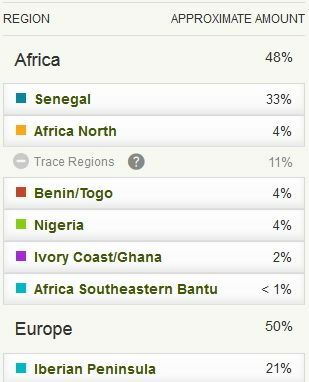 Yet again a predominant “Senegal”score, all other African percentages being Trace Regions. The 8% “European Jewish” is also notable. It shows up regularly for Cape Verdeans but usually only in trace amounts. Relatively quite high “Southeast Bantu” especially when combined with “Cameroon/Congo”. Still both only appearing as Trace Regions unlike “Mali”. 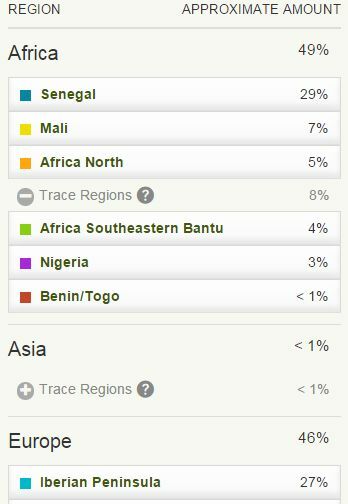 These results show one of the lowest Senegal ratio’s i have calculated for my samplegroup. It’s 44% (19/43) while the average would be about 60%. Only for one other person it was also below 50%. But it’s perhaps telling how all the other African regions are only designated as Trace Regions and therefore with less reliability because the estimate range will also include 0%. His 3% “North Africa” might be correlated with his 5% “European Jewish” and 5% “Middle East”. Intriguing second place for “Ivory Coast/Ghana” and also above trace level. Sofar (n=47) i have observed this for seven Cape Verdean results. All things being the same it seems historically most plausible to assume it is suggestive of Sierra Leonean ancestry. Quite a high “Senegal” score, also as a ratio of total African. 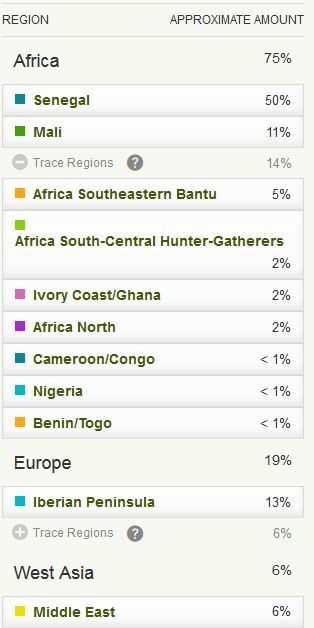 The 2% “South Central Hunter-Gatherers” is noteworthy too, as it may imply Central African origins. Even if minimal it’s still one of the biggest such scores. 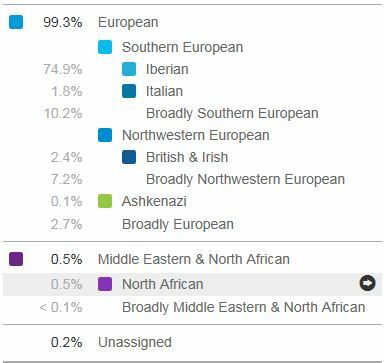 These results are a bit atypical in that they don’t report any “North Africa” at all, but instead 3% “Middle East” and 2% “European Jewish” is being shown. Relatively speaking a low “Senegal” ratio (21/41=51%), however the “Mali” ratio is the second biggest among my samplegroup (11/41=27%). 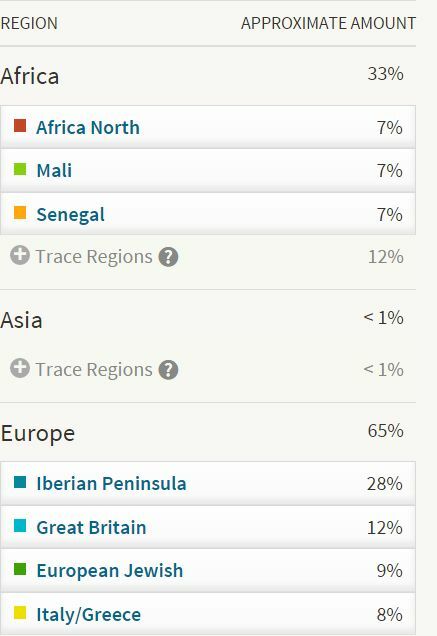 These results show the highest “North Africa” score i’ve seen for a Cape Verdean. Intriguingly it’s only combined by a trace element of “European Jewish” (<1%) and 2% “Middle East”. The parents of this person are both from Brava, however one grandparent is from Fogo and the other from Guinea Bissau. Interestingly with a relatively high “Senegal” ratio of 61% (25/41) it does look a bit distinct compared with other Brava results sofar. Also noteworthy that “Ivory Coast/Ghana” is showing up in second place even if only as a Trace Region. I received these extraordinary results below after finishing my survey. They are from a person with 4 grandparents born on Brava and a family tree that is actually extending many generations further on that island. Intriguingly also including a set of great-great-great parents having been born in Morocco! This is the very first Cape Verdean result i have seen which has “Mali” as the biggest region of the African breakdown! Instead of “Senegal” as has consistently been the case in my survey of 23 Cape Verdean AncestryDNA results. In fact the “Senegal” score being shown of only 1% is very much out of line with what i’ve seen sofar. This seems to suggest that the Upper Guinean origins of this person might be somewhat different than for the average Cape Verdean person. It also goes to show that variation among Cape Verdeans might still be greater than what i had found sofar in my survey. Two other rather exceptional aspects of these results are first of all the total amount of African, 19%, which is the lowest i have observed sofar among Cape Verdeans. Possibly this might also have influenced this surprising outcome of “Mali” ending up as the biggest African region, due to a unique family history. Secondly the amount of “North Africa” is the second biggest i’ve seen sofar. Proportionally speaking it’s over 30% of the African breakdown (6/19=31,6%), which is the highest relative share i have calculated sofar. And again confirms that generally speaking “North African” %’s seem to be negatively correlated with total African (as is also the case with Hispanics). 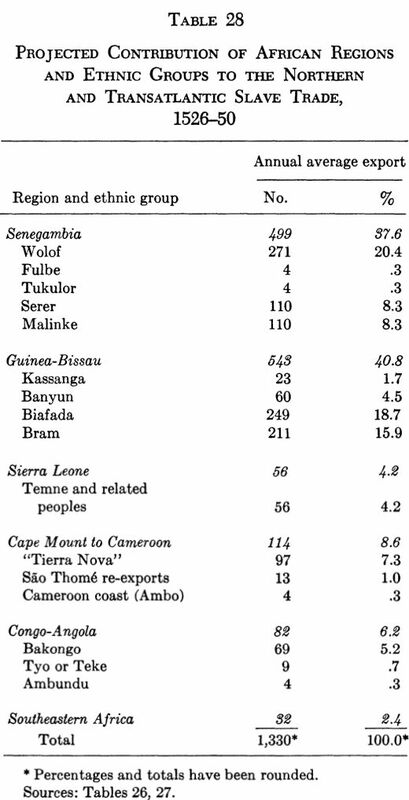 A very high relative contribution of “Senegal”, 41/57 is about 72% of total African ancestry. 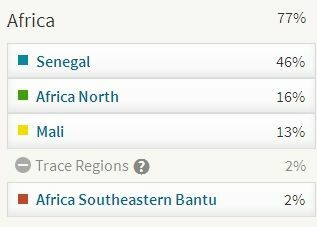 Also remarkable how all 8 remaining African regions available on AncestryDNA are being mentioned as Trace Regions! Another result i received after finishing my survey, and again featuring “Mali” as biggest region in the African breakdown rather than “Senegal”! The total African score is higher than the previous result, but the “North Africa” percentage is equally high. These types of compostions might still be characterized as “atypical” but there are bound to be more of them among Cape Verdeans. Too early too make any further assesment, but it’s also perhaps noteworthy that this person is half Bravan. These results were also obtained after my survey was finished. They belong to the mother of the previous person. Amazingly “North Africa” is mentioned as biggest region!. Even if actually in shared position with “Mali” and “Senegal. With 7% it’s equal to the highest “North African” score i have observed sofar. The total African ancestry level is again lower than what has been average. Especially when deducting “North Africa” as a non-SSA region. I suspect that this will usually be the case also for other Cape Verdeans who don’t have “Senegal” as biggest African region. Possibly correlated with differentiated family origins according to social status. I will need more observations to confirm though. In this particular instance it’s also perhaps telling that the “European Jewish” percentage is relatively very high, even when it does show up regularly for Cape Verdeans, but generally below 5%. These results also show a higher than average “North African” score, but it’s especially the “Senegal” ratio which is exceptional sofar among my samplegroup. 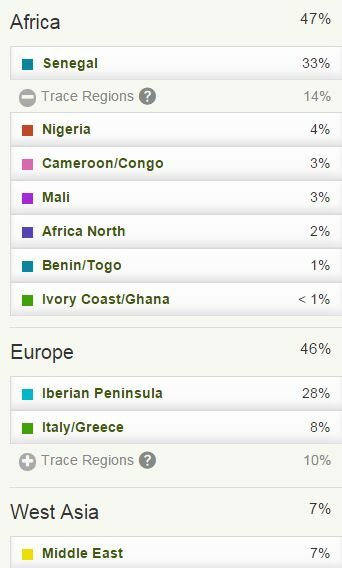 It’s the highest i have calculated, almost 74% out of total African ancestry (45/61). It will be interesting to see if other people with strictly Fogo origins will also score such high “Senegal” ratio’s although in fact also on other islands higher outliers exist, for example the very first two results from Santo Antão. Relatively low “Mali” score. Interesting that “North Africa”and “Southeast Bantu” are shown as having the same percentage but the last one as a Trace Region. Instead of “North Africa” it’s now “Ivory Coast/Ghana” which is showing up as a secondary main region. As my sample group of Cape Verdean results is increasing (n=47) i am finding ever more examples of this region appearing above tracelevel. It could very well be mostly suggestive of Sierra Leonean ancestry for Cape Verdeans. Although other ancestral options also still remain possible. Another person of mixed Brava & Fogo island origins, a very common combination for Cape Verdean Americans. The African breakdown is also pretty much standard except that there is no “North Africa” being reported at all. From what i have seen this quite unusual. Although there is an additional 2% Middle East” included in the results. This guy made an excellent Youtube video about his results, which can be seen via this link. Or also below. His original “Senegal” score of 50% is the highest among my samplegroup but also calculated as a ratio to total African ancestry it’s above average (50/75=66%). He mentions in the video he could have at least 1 possible Fula ancestor from somewhere in the 1800’s. But that might be just one out of several i guess. It might explain the rather high “Middle East” although his “North African” seems about average. Very interesting to compare his overall breakdown with someone of Fula descent (see screenshot in section 4 or also African results). On first sight the results look quite similar. But given their long history of intensive creolization and intermixing of various people from across Upper Guinea it’s unlikely Cape Verdeans would be of exclusive Fula descent. However a partial Fula contribution, significant even, is not be ruled out either of course. It’s noteworthy therefore that not only the predominant “Senegal”+”Mali” combination is mirrored (around 60% for both) but also to lesser degree “North Africa” is showing up (2% versus 16%) and even the “Middle East” (6% versus 17%). This person shows the third highest “Senegal” amount i have seen sofar (n=47). Also proportionally it is above average (40/61=65%). Not that surprising perhaps as this person is mostly from Santiago, the CV island with the highest degree of African ancestry on average. Intriguingly however “Southeastern Bantu” is reported as second biggest region, and also above trace level! Actually i have seen one Cape Verdean result with an even higher score (14%) for this socalled “Southeastern Bantu ” region. But it is obviously a standout feature of this breakdown. As described in more detail above (in section 5) there is still much remaining uncertainty on how to interpret this region. In this particular case Angolan ancestry seems quite likely although Mozambique could also be a possibility. Interestingly this person however does not know of any Angolan relatives. Even when many Cape Verdeans (myself included) have family members who migrated to Angola within the last century or so. Personally i do not know of any documented Angolan reverse migration into Cape Verde. At least not in such plentiful numbers to explain the average “Southeastern Bantu” scores i have observed sofar. However it seems that some Cape Verdean migrants who went to live in Angola sometimes returned with Angolan spouses. Such instances would be very recent and easily verifiable . However as already mentioned this is not the case for this person and i imagine also not for most other Cape Verdeans who show some minor % of “Southeastern Bantu”. This ancestral component therefore probably dates back from before the 1900’s at least and possibly even from much earlier timeperiods. 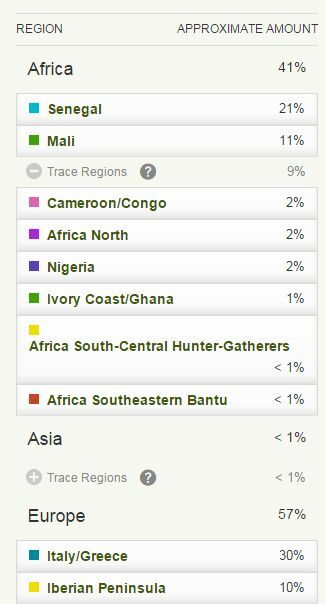 A rather singular breakdown shown below because of the 9% “Ivory Coast/Ghana”, which is reported above tracelevel. 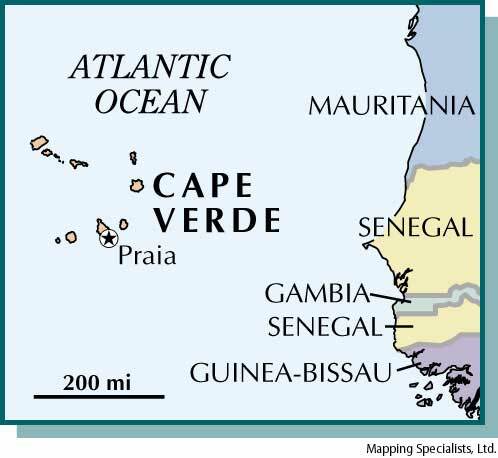 Usually only “Mali” and “North Africa” appear alongside “Senegal” as main African regions for Cape Verdeans. It is the highest amount for this region i have observed sofar among Cape Verdeans. Ironically therefore both results might just as well have been for fully Cape Verdeans. Nothing really sets them apart from the other results i have included in my survey. Without any results to compare with from fully Guinean persons it seems premature to attempt any further analysis. It is fascinating though that the parent with a more pronounced Papel component shows “Mali” as second highest region, while her child instead has a quite noticeable “Ivory Coast/Ghana” in second place. Very interesting results for a person who has grandparents, each from a different CV island. The total amount of African ancestry is the second highest i have observed sofar. But even more remarkable is the African breakdown which shows no less than 4 regions above trace level! This is unique sofar among my Cape Verdean samples who usually show either 2 or 1 main region and in only in few cases also 3. As expected the “Senegal” amount is most prominent (39/69=56%). However the “Nigeria” and “Ivory Coast/Ghana” amounts are not insignificant and actually among the highest such scores which have been reported to me. Especially the “Nigerian” % being intriguing. Another fascinating score would be the 4% “Asia South”, possibly to be linked to Goa or other former Portuguese settlements in India. Rather appropriately these last results seem to fit the described averages for my samplegroup the best. “Senegal” is firmly in top position, “Mali” and “North Africa” are reported as minor but substantial regions. While everything else is designated as Trace Region, even when “Southeast Bantu” is standing out among them. 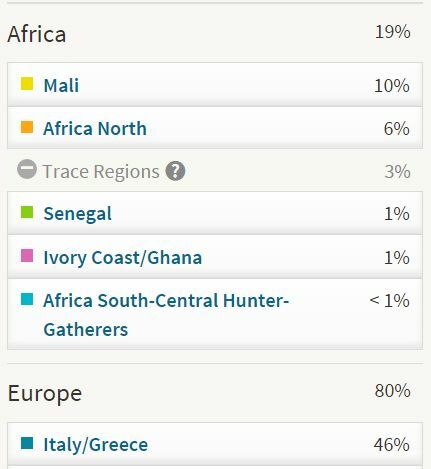 Using the DNA matches I’ve found that I’ve matched with people who have Senegalese ancestry and have told me that almost all of their family comes from Cape Verde. I haven’t found the link between us yet but I’m 100% that it had to be before or during the slave trade. Very interesting! I am actually preparing a new blog post about the DNA matches being reported for Cape Verdeans on Ancestry so keep an eye out for that. Generally speaking when it comes to African American (AA) matches for Cape Verdeans (CV) and vice versa I tend to think there are several possible ancestral scenario’s (assuming it’s an IBD match). None of them to be ruled out in advance. A mutual European ancestor who left descendants in both Cape Verde and the US could still even be possible I guess. In this case there wouldn’t even be any direct Cape Verdean connection. Using a chromosome-browser to establish if the shared segment with your Cape Verdean match is either African or European would be ideal of course. But unfortunately not always possible. Looking at the size of the shared segment also can be helpful. All things being the same you would expect larger amounts of shared DNA (>10 cM) to suggest a recent connection with Cape Verdean-Americans who started arriving in the US during the early 1800’s. They were the first Africans to voluntarily migrate to the Americas! They are primarily located in the Massachusetts, Rhode Island area but there’s also been an early presence in California. Despite relative endogamy they have often also intermarried with African Americans across the generations. If you have any family ties to those states that might possibly explain such CV-AA matches I suppose. And then it would be a direct Cape Verdean connection, but not due to slave trade. Your MRCA (most recent common ancestor) could also have been from anywhere in the Upper Guinea region (Senegal-Sierra Leone). This person could have had one relative taken as captive to Cape Verde while another was taken across the Atlantic. In this scenario you don’t actually have Cape Verdean ancestry but you do share the same Upper Guinean ancestor with your Cape Verdean match. Yeah you’re right! Those do seem like the only plausible explanations for the Cape Verdean cousins. I just found it strange that I never seen it before and they are all outside of the immediate family circles. Hinting at 3rd – 5th cousins. Also giving that my highest African percentages are 38% Nigeria and almost 20% for Senegal which based on the information that I seen here is a little unlikely for a AA to have such high percentages of both of those nations. What’s your POV? Also it’s cool having somone to talk to about this stuff. I’ve gotten the hint that I’ve been bugging my parents about it hah. Haha where is your family from? How many of these CV matches do you have? And what is the highest amount of shared DNA you have seen sofar? I know of a couple of cases where AA’s discovered they had a relatively recent CV ancestor (late 1800’s/1900’s). 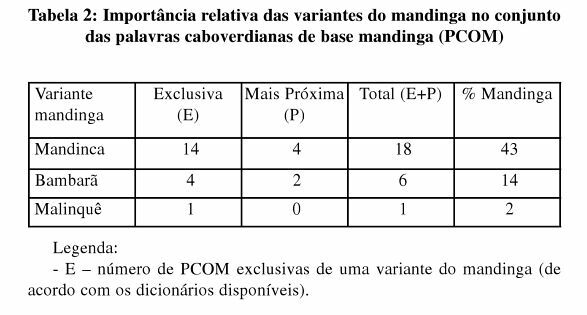 Aside from the increased “Senegal” and the number of CV matches also being assigned to the socalled “Portuguese Islander” migration could be a further indication. One other thing you could look into is the shared matches button when you’re on the profile page of one of your CV matches.If you get an overview of even more CV matches when you click on this button you can be more certain this CV connection is legit. Also if you have any excel experience I would advise you to try this tutorial of mine which involves first scanning all of your DNA matches and then filtering them in Excel. In order to zoom into CV profiles it might be best to first sort on ethnic region and look at all the matches who have Senegal in first place. But you could also apply a socalled textfilter to zoom into profiles who have both “Senegal” and “Iberian Peninsula”. People with Portuguese surnames being the most likely CV candidates. As far as I know my family is primarily from North & South Carolina. I’ve counted 15 matches from Cape Verde and 22 from Portugal but when I click on the DNA matches, I can’t find a shared with any of them except 1 by the name of DeCosta. They are listed at 4th – 5th cousins. I have more foreign matches from Cape Verde and Portugal than I do from Senegal or Nigeria haha. I see, well that does make it even more intriguing! From what i’ve seen such numbers would be atypical for AA’s. Especially the additional Portuguese matches. In case these matches are indeed all “100”%” CV or fully Portuguese (to be verified by public family tree details but also plausible ethnic regions/ surnames mentioned in profile). Most likely indicative of a distinctive line in your family tree I would say and worthy of follow-up research. Interesting also that your family’s from N/S Carolina! 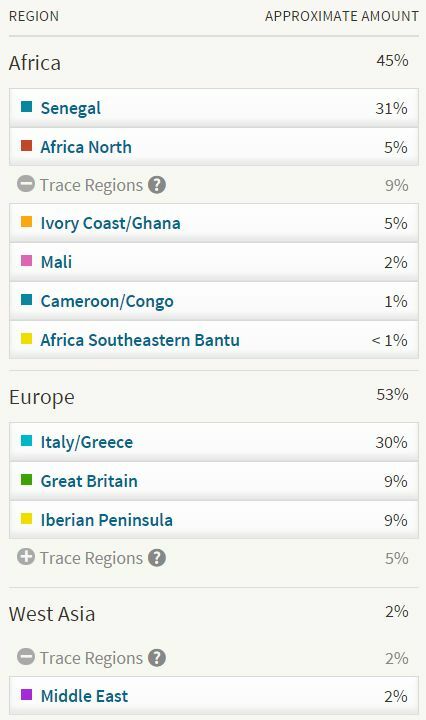 I myself have several AA DNA matches from around that area who i suspect have a mutual Upper Guinean ancestor in common with me, to be traced back perhaps to the 1700’s or even 1600’s. 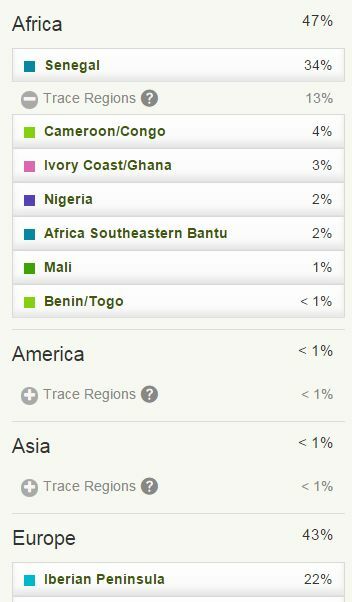 The fascinating thing is also that one of these matches shares my haplogroup L3e4, which is commonly found especially in Senegal-Sierra Leone area. In case you like to go ahead and explore these CV matches further you might want to join this FB group: Cape Verde DNA, Inc. , the biggest online community of Cape Verdean Genealogy & DNA enthusiasts! It has many helpful people and especially if you also upload on Gedmatch they may assist in solving this riddle for you.